Globe displaying location of the Mariana Arc in the Pacific Ocean (left); seafloor (bathymetric) map of the Northern Mariana Arc (middle); and the Northwest (NW) Rota-1 submarine volcano (right). The seafloor is colored according to depth, with cooler colors in deeper areas and warmer colors at shallower depths. The volcano (shown to the right) is located approximately ~100km to the north of the island country of Guam. It rises to a height of 535 meters below sea level, and its base is over 2000 meters deep. Brimstone Pit is near the summit of the volcano at 555 meters depth Image adapted from USGS and NOAA. Image credit: NOAA. Scientists use underwater acoustics to map, monitor, and evaluate the eruptions of submarine volcanoes. Acoustic data make it possible to quantify the character of submarine volcano activity, including duration, frequency, intensity, and evolution over time of eruptions. The Mariana Volcanic Arc, located in the western Pacific Ocean, north of Guam, contains at least 20 submarine volcanoes. In 2004, at submarine volcano NW Rota-1, with a peak 517 m below the surface, scientists observed and recorded the sounds from an underwater eruption. Ash and lava fragments were spewing from the volcano. Hydrophones recorded acoustic data during cyclical gas-driven bursts lasting 2-6 minutes. These bursts were separated by shorter, non-eruptive intervals lasting 10-100 seconds. The short “pauses” were associated with cooling lava that forms a temporary quench cap over the vent site. Gas pressure builds beneath this cap, until the cap is eventually blown apart. Acoustic signals of the gas-driven explosions have frequencies of 1-80 Hz, with a peak at approximately 30 Hz. Each acoustic burst starts suddenly. The amplitude gradually rises for 30 seconds, and then sharply increases further. This higher amplitude is often sustained for the duration of the acoustic burst. In 2008, underwater explosions with a broadband sound source level of 192 underwater dB were recorded. Other submarine volcanoes in the Marianas Arc, as well as other arc volcanoes in the Lau Basin and other Pacific locations, have been studied using underwater acoustics. 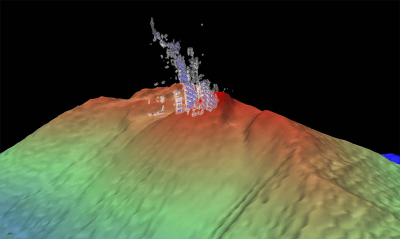 3-D map showing gas bubbles (CO2) rising above the summit of submarine volcano, NW Rota-1. The bubbles were imaged with an EM122 multibeam bathymetry mapping system. Scientists found bubble plumes at NW Rota-1 to rise 200–400 m above the vent sites, but dissolved before they reached the ocean surface. Bubble plume heights and volumes were variable over time and correlate with the volcano’s eruptive intensity. Image credit: NOAA.